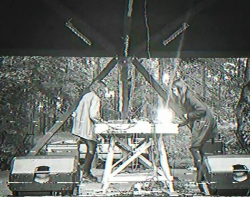 As Longitude are Berlin sound explorers Laura ODL and Eva Geist. They began their electronic sessions riding on a wave of fresh and fertile inspiration. They compose their live performance from endless bass loops, drum machines and sequence riffs, synths and manipulations. The result is a unique, experimental sound with sparkling soundscapes and blurred rhythms. Their sets are voyages from stratospheric heights to earthbound rituals.